Kari and I got the chance to decorate for a wedding last weekend. 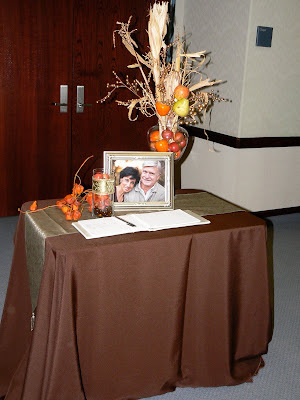 It was a fall themed reception, which we both LOVE, and brought back so many memories from when we did Kelly & Julio's wedding 2 years ago this month! (Happy Anniversary guys!) All of the pictures were taken in the evening so they will not give you the full effect of what it actually looked like in person. The entrance was flanked with pumpkins and candles. Such a beautiful prelude to the indoor decor. The guest book sign-in area was complete with a refinished bench (a gift to the happy couple from the bride's daughter), a GOLD tree, and more pumpkins! On the sign-in table you'll notice the beginning of a common thread throughout our decor - our "flower" of choice was real cornstalks. Their form is so rustic and beautiful - perfect for a fall wedding! 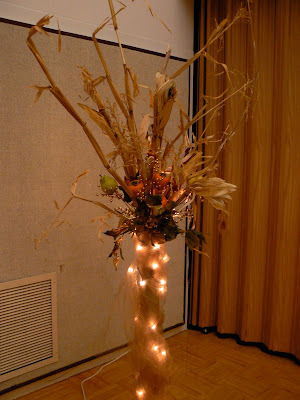 Upon entering the cultural hall you were greeted by our most genius creation - the cornstalk spray. These babies stood almost 7 feet tall! The bases were wrapped in lights and gold toulle, gold berries, a little greenery, and fruit was skewered to add a punch of color. 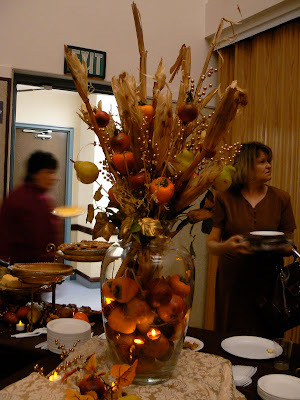 The centerpieces were a flameless flickering candle (we were in a church building - no fire allowed), wrapped in ribbon, surrounded by a grapevine wreath wrapped in a fall leaf garland, some gold berries, and tons of real fruit. The tablecloths were chocolate brown, with olive green runners, and a gold ribbon accent. From above, we hung gold ribbon, with tealight lanterns (flameless flickering again here) - they were so beautiful in the darkened room! The lowered ceiling made just the right amount of intimacy for this event. This final picture does not do justice to our most favorite bit of creativity - the floral arrangement done for the food table. The jar itself stands about 3 feet tall. It was filled with more fruit, tealights, and all the same goodies as our tall sprays. It weighed close to 75 pounds once it was full. Special thanks go out to so many friends and family members who helped out with the setting up, creating, and taking down of all this beauty. We couldn't have done it without you! It was a beautiful evening and we owe you countless thanks for being a part of it all. Congrats to the happy couple - we wish you all the best in your new journey together. We were so happy to be a part of your wedding celebration. Ok...your decor leaves me breathless! You are sooo talented! Fall is my favorite time of year also, and you have mastered the art of decorating during this season! I am very impressed! Congratulations on an incredible job!